Would you like to promote your company branding? 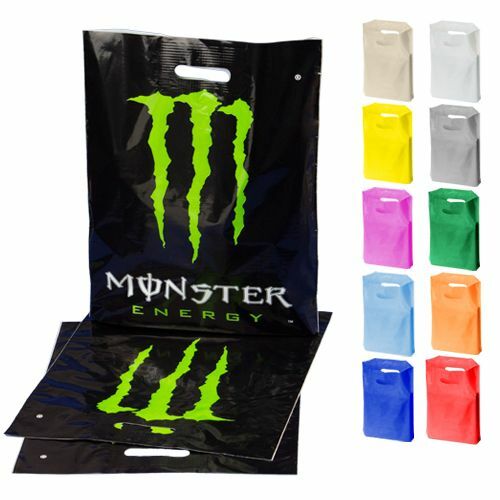 Order custom die cut handle bags specifically made for your business brand and build free awareness! From your logo, color and font, we ensure that the result is polished and refined. Our logo printing services ensure true printing without loss of quality. We pride ourselves with using only bags made from recyclable environmental friendly plastics Made in the USA. Call us for your custom order now! Fastest production time in the industry! 15 working days or 3-10 Day Rush Available. Perfect brand awareness for retail and trade shows! Low density polyethylene 1.75 mil (lighter or heavier are avail upon request). Price includes up to 4 color printing on both sides, 50% ink coverage. Additional imprint colors (up to 6), Over 50% coverage, reverse copy printing, or silver/gold ink. 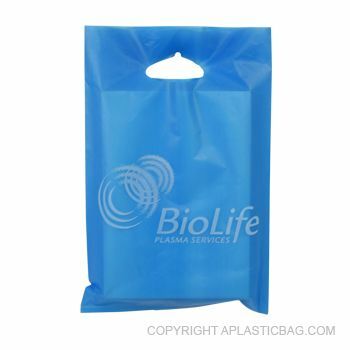 Reusable or biodegradable plastic die cut handle bags available. 4-color process printing (photo like image) or custom sizes. Now showing the options for "1.75 Mil" and "1 Color - Flexograph Print"
15 X 18 + 4"
18 X 18 + 4"
20 X 20 + 4"
22 X 22 + 4"
Die cut handle bags are some of the most economical and popular plastic bags in our line. They are ideal for carrying lightweight to heavier items. 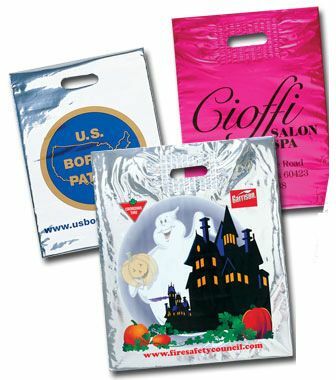 These punched-out, handle-hold die cut bags are your best value for premium quality prints in large quantities. Choose from a variety of bag sizes, colors, and thickness. 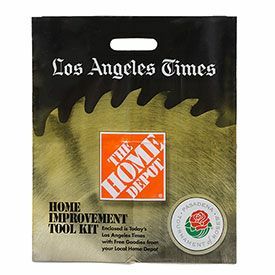 Soft and super gloss die cut handle bags are also available. 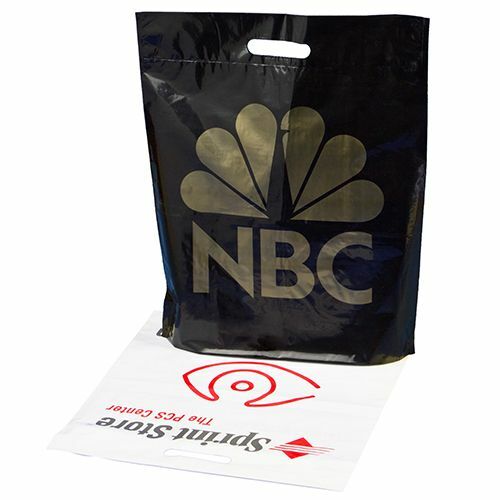 Die cut handle bags are extremely inexpensive and the perfect option for all retail purposes. Crafted from thin environmentally friendly plastic, you can order these die cut handle bags in a large number of varying designs and sizes to fit any need. 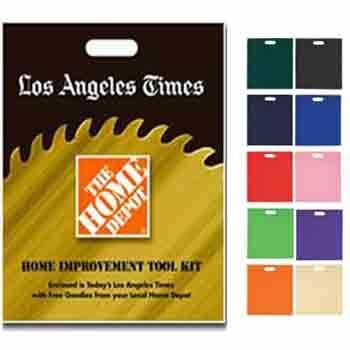 For the best results, get custom printed die cut handle bags specifically made to suit your business. Do you need overnight production? Ask about this service! 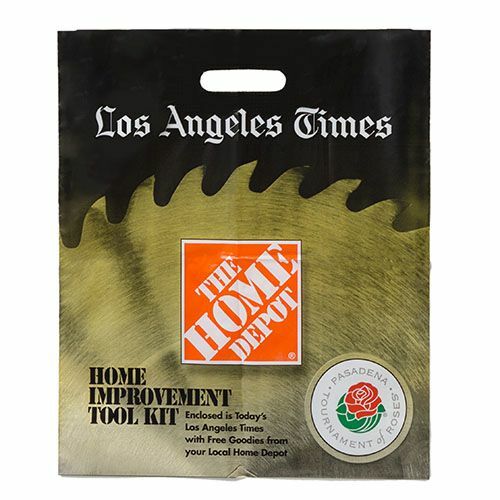 Customize your die cut handle bags to accurately represent your company for any occasion. We offer several ranges of standard colors and printing processes to guarantee your plastic bags look, feel, and handle the exact way you want. Our die cut handle bags are crafted from recyclable and bio-degradable materials, these are perfectly safe for use. 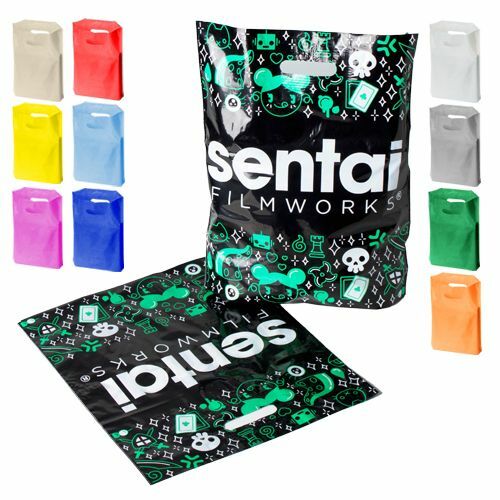 Our unique design process is capable of printing up to 6 colors, including high impact 4-color process on our plastic bags. When 4-color reproduction is not feasible due to cost constraints, we offer halftone reproduction to produce a premium print design. We can create various step and repeat designs of your logo and taglines to add maximum impact to the look of your plastic bags. 9 x 12 Ideal for accessories, jewelry, greeting cards, and small items. 12 x 15 Suggested for trade shows, brochures and paper products. 15 x 18 + 4 Our most popular size, perfect for trade shows, giftware, and apparel. 18 x 18 + 4 For large clothing and giftware items. 22 x 22 + 4 Best suited for large items and multiple sales. Lead Time: Our lead time is the lowest in industry, we even have rush availableto meet your deadline, and often our competitors use 8-10 week lead times vs. our 2-4 week lead times. Do you Need Overnight Production? Ask about this service? Bag Thickness: Bag thickness is very important, the price is based on thickness, 1.75 to 2.5 mil. The thicker bags are more costly. Be sure check which thickness has been quoted before placing an order. Material: There are a few different types of material, low densityhigh density and liner low density. Most commonly used is low density, which is a shinier and smoother material. Quality: Whatever your need, we have the perfect option for you. From any design, bag style, thickness. Our goal is to go above and beyond by delivering you the perfect custom bag to match your business’s needs. Made in USA: Our bags crafted from recycled environmentally friendly plastic made in the USA. All of our bags are designed, printed, and assembled right here in the USA. Your advertising messages imprinted directly onto plastic sheeting. Pre-made blank bags are hand fed into a press. 5000 bags minimum. 250 bags minimum. Large imprint area or full bleed, edge to edge. Limited print area. Up to 8 imprint colors available. Maximum of 1 imprint color. Tighter registration on 2-colors or more. Tighter registration not available. 15-20 Day production time. 7 day production time.